Know when to hold ’em, know when to fold ‘em. My friend and five-decades-long trading legend Peter Brandt (@peterlbrandt) has mentioned numerous times in various blog posts and interviews that over his entire career the hardest trades to hold are never the losers. Losers get cut out of the portfolio quickly and unemotionally. They are simply the cost of doing business. No, the hardest trades for him to manage are the ones that immediately go hard in his direction, piling up rapid gains. Rapid Gains? What is so hard about making money? Emotions and psychology make it hard. Yep, when you’re engaged in a deliberate practice of honoring stop losses, you’ll find that the vast majority of your trades fall into the small loser and small winner buckets, effectively canceling each other out. And you kind of get lulled into sleep expecting most trades to land in one of these two buckets. And so when you’re suddenly jolted awake by a stock that surprises you to fast gains right out of the gate, a very natural impulse is to want to quickly book this above average profit and congratulate yourself on closing the trade before it inevitably reverses. And in many cases, it would’ve been the right choice to make. The problem is, this type of behavior virtually guarantees you’ll never have a monster winning trade. And its the occasional monster win that makes all the difference in the world in long term trading results. At Trade Ideas, we’ve gone to great lengths in an effort to help give intraday traders confidence when making a decision whether or not to hold on to a quick winner and give yourself a chance at the big gains. Our Artificial Intelligence engine, HOLLY, tracks two separate P/L paths for her daily trades. 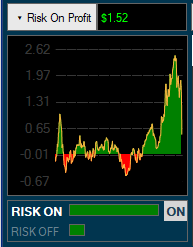 The first P/L chart we display is the “RISK OFF” graph which tracks how her profits or losses are accumulating during the day in all trades that she entered and exited (she has 5 unique reasons she’ll exit a trade). It’s called “RISK OFF” because HOLLY is always seeking to make money and then take off the risk and redeploy into the next best trading opportunity. The second P/L chart we display is a “RISK ON” graph which tracks what your P/L would be had you entered all the trades when HOLLY entered, but instead you held these stocks all the way into the close of trading. As the trading day goes on and HOLLY has dipped her toes into the market, we’ll often start to see divergences in these two P/L graphs where one is clearly outpacing the other. This is proving to be a tremendous indicator for intraday traders facing decisions on how best to manage their open trades (especially the winners). When RISK OFF is out-performing, that is often a clear indication that we’re experiencing choppy market conditions and you will want to take any quick gains you experience off the table quickly, or at least trim your position. Because in this market, profits are proving to be fleeting and can quickly reverse on you. But for those of you who have trouble knowing when to hold on to your winners to try to stretch for greater gains, you’ll find that when RISK ON is outperforming, this is a pretty clear indication that Traders are getting paid to sit on their hands and to be patient with their winning trades. You’ve got your stop loss in, now go take a walk. These are the environments where you’re more likely to see a small winner stretch into a monster gainer that makes your week or makes your month. This small but powerful indicator is just one of many features that makes HOLLY and invaluable tool for intraday traders. If you’d like to learn more about HOLLY, please head here. Or, if you’d like to subscribe to Trade Ideas with access to HOLLY, I invite you choose a monthly or annual Premium subscription here: http://bit.ly/2wDGRc8 and use promo code: CHICAGOSEAN to take 15% off an annual subscription (or 15% off your first month of a monthly subscription).